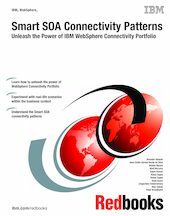 This IBM® Redbooks® publication provides you with a path to demystify the complexity of adopting a service-oriented architecture (SOA) approach to integrating applications and services. With an iterative evolution of a fictitious company, which is called ITSO Enterprise, we demonstrate several scenarios about how we can implement an IBM Smart SOA approach that helps ITSO Enterprise to achieve its business goals to be a global interconnected enterprise, one step at a time. It is not our intention to dive into the extremely technical details of every product or to tell you specific solutions for specific problems, but rather, to advise you about how to look at these problems from a business context perspective and then to provide you with a concise deployment using the IBM WebSphere® Connectivity portfolio of products to easily address them. This book will be a reference for IT Specialists and IT Architects working on implementing Smart SOA solutions using the IBM WebSphere Connectivity portfolio of products at client sites, as well as for decision makers, IBM employees, IBM Business Partners, and IT Managers.